Do you have a vision of what is going to happen ? I don’t really have a vision of what I think will happen, but I have several ideas. I like to think that there are ideas that I have that will some day come true. Although, I admit, some of the ideas I have are pretty far-fetched. Some of them I call my dreams of what I think will be the world to come. Some I think are way off into the future and some are more short-term, and some I don’t think I’ll see before I die. So what kind of ideas do you have ? Do you think you have some visionary ideas ? There are a few people out there that have such fantastic ideas that I refer to them as visionaries. A good example of what I think are true visionaries or individuals that have visionary ideas in our times and possibly an immediately recognizable person I can site as an example is Gene Roddenberry. If you don’t know who he is, he was the creator of the Star Trek TV/movie series. Why do I like Roddenberry as an example ? Because Roddenberry wasn’t simply writing a series that would entertain. He truly believed that in the future: we would no longer need money; poverty would be a thing of the past; hunger and disease would be a distant memory, and that everyone on the planet would have access to a good education. He had a vision and Star Trek was the conveyance for those ideas or ideals. He also believed that, societies and cultures would live harmoniously and have respect for each other. A pretty fantastic vision, isn’t it ? I really respect Roddenberry for the ideas and for also having the vision to convey those ideas and trying to give his interpretation of what the world could be like. Certainly there are a number of people who influence our world and irreversibly change the way we see things and that change the way we do things. For example, 10 years ago, I hadn’t ever imagined that I could be on a plane traveling at 8.5 miles a minute and be able to lie flat on a seat and enjoy a movie on my own personal TV screen. A movie that I decide to start, pause or stop at any point. I also hadn’t imagined that I’d be able to type up a blog while doing so. But thankfully there are some very visionary people in our time and in our world. Visionaries that had the balls to take risks and go out and do what they believed and tried to make something of the things that they believed in. I also think that due to a number of advances these folks have been able to take ideas from what most of us would think are disparate sides and be able to combine them. 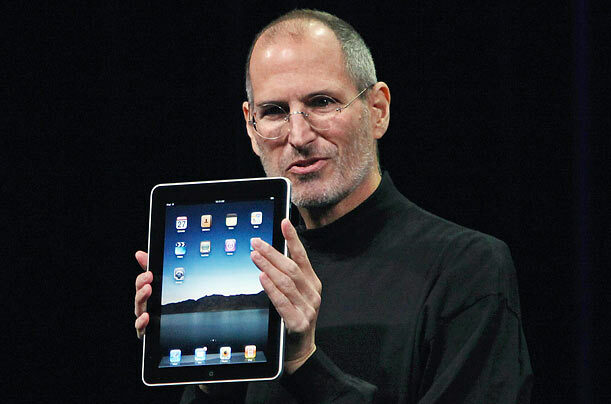 Think of it this way… Steve Jobs didn’t invent the touch screen nor did he invent the concept of tablets, but he had the vision to combine them and believe in the idea. Drum-roll for the iPad/iPhone. Now I get there was a progression here. And it wasn’t like the iPad was immediately conceived. But now that it’s here, there is no going back. As my U.S. friends would say, “you can’t unring the bell”. Honestly I don’t understand the true meaning of this phrase, but I get the concept, and there is no going back, and really, would you want to ? Once we get these ideas and they influence our world there is no going back to the status quo prior to the invention. For some of us we can look to the ideas and we can build upon the newly discovered concepts. Think of it like a sort of pyramid or building block concept. Without the foundation, the structure would fall/fail. Just think of the number of apps that have been created for the iPhone and iPad. I think you get the idea here. I hopefully think that at some point I will be able to put some of my ideas into action. I am looking forward to the time that I can make a mark on the world and be able proudly to say “Yes, that’s my idea”. I hope and think that it’ll happen in my life and it’ll be very cool when it does. So what are your ideas ? Do you see a window where your ideas will come to fruition ? Think about what your idea is and how you think it could be delivered. More importantly, think about being ready to act quick. It may be sooner than you think. Jeri, Couldn’t agree with you more !